Topricin® is the culmination of many years of research in the area of regulated natural medicines. The result is a line of pain relief products for the whole family that work with no side effects. Our patented topical formula aids in the healing process by improving blood flow to the injured tissue and draining toxins and fluids that build up as a result of injury or painful ailments like arthritis. Unlike many other over the counter pain relief creams and medications that just mask symptoms, Topricin® stimulates the body's desire to heal the damage that is causing the pain. Whether for muscle pain, joint pain, soft tissue pain or injury, Topricin® is often the first treatment that doctors, chiropractors and physical therapists recommend. 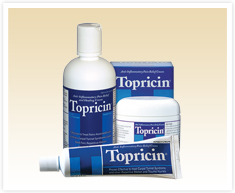 An FDA-regulated over the counter medicine, Topricin® is the leading natural therapeutic brand.